The second edition of Differentiating Instruction and Assessment for English Language Learners: A Guide for K-12 Teachers is coming soon! 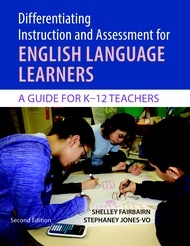 This user-friendly guide shows elementary and secondary general education and content-area teachers, as well as literacy, special education, and English language development (ELD) specialists, how to differentiate core content-area instruction and assessment for the English language learners (ELLs) in their classes. The book provides concrete strategies that teachers can use in any content-area classroom to engage every ELL, from beginning to advanced levels of ELD. The authors also highlight how teachers can address critical differences between ELLs with a strong foundation in the home language as well as students with limited or interrupted formal education (SLIFE). Included with the book is a quick-reference poster that organizes student descriptors, appropriate assessments, and instructional strategies according to five levels of ELD. The book is aligned with national and state English language proficiency standards and assessments, and it gives teachers tools to ensure that every ELL develops the oral and written academic language they need to reach high content-area standards and succeed at school.